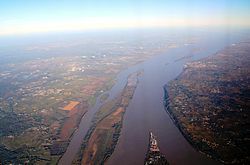 The Gironde is a navigable estuary in southwest France and is formed from the meeting of the rivers Dordogne and Garonne just downstream from Bordeaux. Covering around 635 km2 (245 sq mi), it is the largest estuary in western Europe. Philippe Leyrisse will speak about the estuary and especially its role in the Second World War in 1942 with Operation Franckton which was aimed at destroying boats moored in the Bordeaux port.